Hands-on, experimental workshop introducing simple mechanisms and how they can be harnessed to power kinetic artworks or automata. 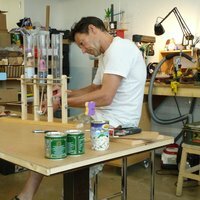 This practical workshop introduces basic mechanical movements, such as cams and cranks, and how they can be used to create kinetic art or automata. You will be provided with mechanical and structural components made of pre-cut wood, wire and shaped metal rod, that can easily be assembled into a working prototype. In the time available, everyone should be able to complete an original kinetic artwork that comes to life at the turn of a handle (although finishing touches can be done later at home). The prototype machine provides a springboard to play around with the mechanisms, investigate how they can be adjusted, shaped and configured to change the ensuing pattern of movement. In tandem with this process is exploring how the movements can be applied for their artistic potential. Art and craft materials and a box of junk will be provided for the decorative designs. You can focus just on the prototype machine, or can further develop its complexity by building on more movements, cutting out cams, or can reconfigure the whole thing, subject to the limitations of available materials, time and skills. The tutor will bring along a collection of automata and mechanisms for studying and inspiration. Overall, the creative process is hands-on experimenting and assemblage, rather than design and build. By the end of the day, everyone should have an understanding of how simple mechanisms work and their overall function as control systems, the necessity of accuracy and precision in the making process for machines to work well and reliably, how to use basic workshop tools, and above all, to be excited by the creative possibilities of engineered art. Materials shared amongst the group, including kit components to make a prototype mechanism, other wood, metal, and mechanical parts, and some junk/found objects and art/craft materials. Stephen Guy is a practical hands-on maker and mechanical artist specialising in running automata. He regrets the apparent demise of people's ability to use tools, to repair, hack and maintain the physical things on which they depend. He wants to help revitalise a practical and inventive making culture, and raise the status of skilled craft and technical work.